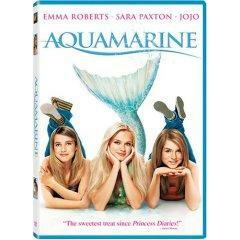 June 2006 brought Aquamarine to DVD. This sweet movie is perfect summer viewing for teens and pre-teens looking for the video version of a beach read. Based on a book by the incomparable Alice Hoffman, this film is a modern fairy tale with the warmth of Sisterhood of the Travelling Pants without the heart-wrenching moments. Part friendship flick and part romantic comedy, Aquamarine introduces us to best friends Hailey (JoJo) and Claire (Emma Roberts). Their summer is coming to a close and not only have they not attracted the attention of their hunky lifeguard crush, they are also dealing with Hailey's impending move to Australia. As if that isn't enough to deal with, the girls find a mermaid washed ashore after a big storm. A mermaid? Yep, the enticing Aquamarine (Sarah Paxton) is a mermaid looking for love. If she can prove the existence of love to her merfather, she can avoid an arranged marriage; if not, it is back to the seas for her loveless future. Desperate for help, Aquamarine promises to grant a wish to Hailey and Claire if they can help her discover love. Handily, during daylight hours the sea nymph sprouts feet, so she can flirt with Raymond, the handsome lifeguard. Looking for a thoughtful, intelligent movie? You should probably keep looking. However, this predictable movie is fun, sassy, and funny. The story is believable - for a fish tale - and the characters are warm and likable. The plot is one that all ages can follow and it has enough depth to qualify as quality family viewing. With the appeal of a mermaid, younger children may ask to see the Aquamarine Movie on DVD. Is it appropriate? While concerned parents should preview the film for themselves, the PG rating is based on the light romance elements in the movie and some mild language. There is no violence in the film. After watching it, I allowed my mermaid-obsessed four year old daughter to watch the movie and she loved it, although she wished there was more of "Aqua" in the water. The adult situations were largely over her head and we watched it together to discuss the inappropriate language, lest she pick it up… Her review? She loved it and wanted to know how soon she would be allowed to watch it again. And, unlike many of her movies, I'll actually enjoy sitting down and seeing it with her again, too. The DVD includes a widescreen version as well as the traditional full screen movie.